Santa tucks each reindeer in bed for a night of restful sleep before their important journey around the world. 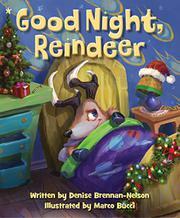 The rhyming story opens with a nighttime scene of the reindeer—the familiar, named ones from Dasher through Rudolph—engaged in a snowball fight when Santa and Mrs. Claus call them in. The anthropomorphized reindeer have their own bedrooms in their house at the North Pole, complete with beds, toys, and modern possessions such as an e-reader for Blitzen and a drum set and electric guitar for Cupid. Santa stops at each bedroom to say good night to each reindeer by name, with an added phrase describing that reindeer’s special talent or interest. Dancer wears ballet shoes, Comet’s room is decorated with models of planets, and Rudolph seems to be reading under the covers using his built-in light. Mr. and Mrs. Claus are white; one of their elves and a doll have brown skin. The rhyming text is catchy and humorous, although two of the rhyming word pairs are near misses (hooves/shoes and elves/bells). The story has echoes of Goodnight Moon in its bidding goodnight to items in bedrooms and in an illustration of a golden moon shining down on the waiting sleigh. Dark, atmospheric illustrations have a surrealistic vibe, mysterious and just short of scary.